Presidency says recent victory signs of Buhari-Osinbajo prospect in 2019 – Royal Times of Nigeria. 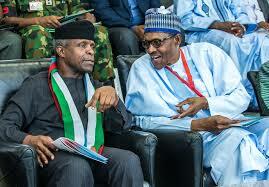 The Presidency has described the outcomes of last Saturday’s polls in Bauchi, Katsina and Kogi states, where candidates of All Progressives Congress (APC) emerged winners of the by-elections, as signs of electoral victory for Buhari/Osinbajo ticket in 2019. Senior Special Assistant to the President on Media and Publicity, Malam Garba Shehu stated this when he addressed State House correspondents on the outcomes of the elections in Katsina, Bauchi and Kogi, and Ekiti. The presidential aide, who described as fabulous the results of the polls in the three states, said the outcomes had clearly indicated a vote of confidence on the President Muhammadu Buhari administration. While thanking Nigerians for maintaining the confidence reposed in the APC administration, Shehu assured that the Buhari administration is determined more than ever before to bring the promised change to Nigerians. Shehu, who also spoke on the urgent need to approve the INEC 2019 budget, appealed to the National Assembly to be on the same page with the Buhari administration.